BANGI, 17 July 2012 – Malaysia has so far been able to thwart extremism in the country because it has been successful in tackling poverty where widespread poverty is no longer present, a Distinguish Professor at The National University of Malaysia (UKM) said today. 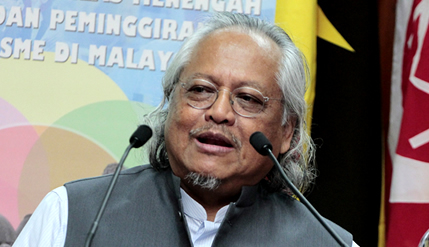 Director of the Institute of Ethnic Studies (KITA) of UKM, Distinguished Prof Datuk Dr Shamsul Amri Baharuddin, however, said that the threshold for the breaking point of something untoward occuring needed to be studied to stave off such a possibility. Giving his keynote address when opening a one-day National Seminar on “Development of the Muslim Middle Class and the Sidelining of Extremism in Malaysia” organised by the Institute of West Asian Studies (IKRAB) here today, Prof Shamsul Amri said such a possibility must be minimised because the youths of today are not like those of 40 years ago. He said some Muslims turn to extremism or terrorism as a last resort when they perceived that nobody cares or are willing to fight for the rights of the Muslims. Extremism, he said, is neither inherent nor in the DNA of Muslims but is a form of protest due to the lack of attention to the injustices inflicted upon Muslims both in their home states or abroad. Prof Shamsul Amri said that extremism, or terrorism may be an avenue for the young, or the New Class as he described them, to fight for freedom. Freedom, he said, means different things to different people. For some Muslims, it means halting the United States and Israel from further intervention in West Asia. To others, it is defined by their struggles to overthrow perceived corrupt and autocratic regimes who have overstayed their welcome, such as seen lately in the so-called Arab Spring in Tunisia and Egypt. In Malaysia, soon after Independence in 1957 there were concerns among the Malays that they could resort to extreme measures because of being sidelined despite the country experiencing rapid economic growth. Thus the Bumiputera Economic Congress in 1966 attended by many eminent Malays predicted ominous occurances if the socio-economic balance between the races were not rectified. The recommendations were eventually accepted and became part of the New Economic Policy (NEP) following the May 13 1969 riots. He believes that a new post NEP era would come about in the country not ony because of changes taking place overseas but also in Malaysia. Just 20 years ago, who would have thought of the demise of the Soviet Union and the cold war in Eastern Europe. Extremism, he said, has too often been labelled on the resurgence of Islam because the West fears the rise of the economic power of the Islamic nations ever since the so-called Oil Crisis of the 1970s. The term extremism has also different ramifications depending on which society perceives it. To the poverty-stricken peoples of Egypt and Tunisia, the protestors and activists in Tahrir Square and Mohammad Bouazizi Square were seen as heroes. But not so among the leaders and elite of some of the regimes in other Arab nations, who dismisses them as extremists. However since the West supports the protestors and activists, the rest of the World followed suit in perceiving them as freedom fighters, regardless of whether they were right or not, Prof Shamsul Amri said. A total of nine academics and scholars presented their papers apart from Prof Shamsul Amri at the seminar.